We just posted today on the Admiral’s Den changes to certain elements of combat that will help with game control. Adding the Defender keyword to aircraft carriers allowing them to intercept attacking units. Also only allowing unintercepted units to fire at the defending player’s Flagship, resources or construction items. We are proud to announce that the first expansion, NATO vs the Blok will go into full release sometime in November, just in time for Christmas. We will look at a tentative release date of Nov. 8th 2018 for the entire cube expansion and token cards. 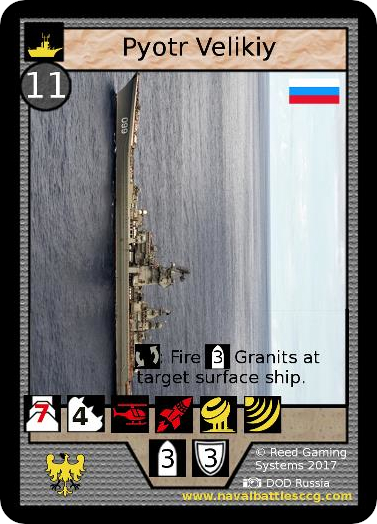 Also remember the digital version of Naval Battles: CCG is available to download. Signup for the BETA and get exclusive deals on printed cards available to no one else. CLICK HERE for more details. Today the LackeyCCG plugin goes live and is now available to download. Players who signup for the beta test will receive the plugin URL instantly to their inbox. Click Here to goto the signup page. Today we have two big announcements to share!! First the release of version 3 of the Admiral’s Handbook with all the rules changes that have been tested internally and are now ready for the game. These rules are legal effective immediately for the paper version and Sept. 3rd for the LackeyCCG version. Click the game tab to download the updated rules. Second we are now opening the application for the Beta test of the LackeyCCG plugin. Players now have the opportunity to sign up to test the plugin as well as new cards planed for future printed sets. Click the LackeyCCG Plugin tab for more info and to signup. Today was announced on the Admiral’s Den the release date for the LackeyCCG plugin will be Sept. 3rd 2018, which is Labour Day in North America. On that date players who have been approved for beta test will receive the URL for the plugin to allow players to download it directly into Lackey. A tutorial will be prepared on how to install and operate the plugin. More details are on the Admiral’s Den HERE. THE GIFT PACK IS BACK!!!! The Gift Pack has returned and still the same great price, only $49. Buy one for yourself and one for a friend and you both can have fun with this great customizable game. Click Here to see all our current specials. LackeyCCG Plugin for Naval Battles almost ready for Beta testing!!! We recently posted on our Admiral’s Den forum and made changes to support the public Beta testing of the Naval Battles: CCG plugin for LackeyCCG. In the coming weeks there will be more announcements on how players can obtain the URL link and details on special offers on printed cards for those who beta test the plugin. The first cards for the Dreadnaught side-expansion has been officially posted on our website. The USS Zumwalt stealth destroyer in full frame art design along with other new legendary ship cards. Click Here to see cards that will be available in the Dreadnaught decks. Announcing today, added to the cube game new art for all rare legendary ship cards that feature the new full frame design. All 7 legendary ships in the Core set have been updated and some with new pictures. These card designs are available now in the Core set Cube Game and Intro decks for the same low price. Also updated are all 5 legendary ship cards from NATO vs. the Blok. These card designs are available in the Cube Expansion and Intro decks. Buy today and have all the new images. Featured card is the USS Yorktown with a new picture showing more detail with the larger frame. Yesterday the first card of the Dreadnought side set was revealed, the USS Zumwalt. And with that revealed a new art design being tested on ship cards. New legendary ships being created for the Dreadnought set will be exclusive and will be in full framed art. Development of this set is still ongoing and details are thin. This card will definitely be good in all constructed formats. However this set will be delayed until there are more sales of the Core set cube game or associated packages. Go purchase your pack today and support this expanding game.